Last year Avid ran a survey through their Avid Customer Association about future directions for Pro Tools and their other product ranges. They have just launched a follow-up survey which I have already completed and wanted to share what I found with the Pro Tools Expert community. Do I Have To Be An ACA Member To Vote? Good news, you don't need to be a member of the Avid Customer Association to vote, however, participating means you will automatically become a member. You will soon receive an email granting you access to the ACA Portal after submitting your vote. You will need 20 - 30 minutes to complete the survey. You only get one go and it must be completed in one sitting. They recommend that it is best to complete the survey on a desktop computer or tablet. Avid does not advise using a mobile device/ smartphone. 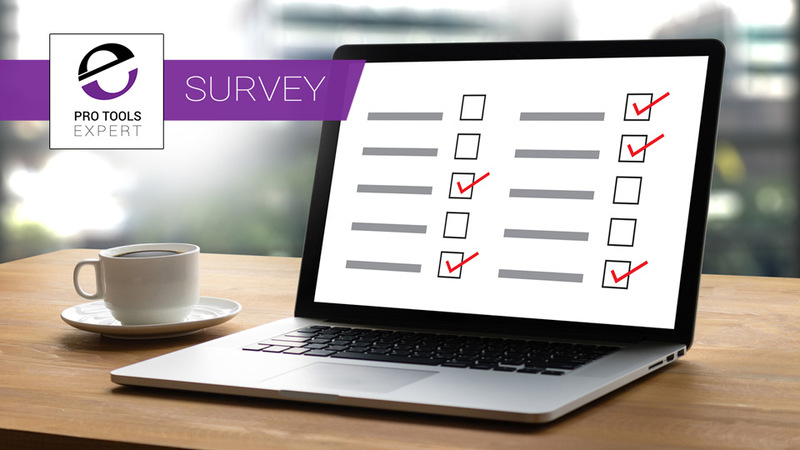 Avid is surveying users from a variety of workflows and depending which ones of these options you select you will get more or less questions to answer. As you can see, some of these options are choices from last year's survey and some are new and give us an insight into possible new feature sets Avid might be looking at. It seems strange that they are still asking about the Lower Cost Audio I/O even though it was the 2nd most popular option in last year's survey and is 'under investigation' during 2018, whatever that means. This suggests that they are looking into replacements for the Artist Mix and C24 as well as allowing multiple S3 control surfaces to be linked together as you can with the Artist Mix. They also appear to be looking at some Eucon developments too. What was curious was that some of the options in this list were also on the first part of this survey and I found this confusing. Again they are re-surveying a number of features that were ranked last year, which I find a little strange. It is almost as if they don't believe the results. I am pleased to see 'On Premises Collaboration' on the list for the film post-production community as I cannot help think that the collaboration features would be very useful for you as long as it is completely secure across an internal network. Personally, I am very pleased to see 'Enhanced Import Session Data (Multiple Sessions Open at Once)', 'Phonetic Indexing of Audio in Pro Tools (phonetic text search of audio in Workspace to find all dialog matches for entered text)' and 'Folders in the Clips List'. Avid can I have these today please ;). To me, this seemed a strange list, so I chose Other and asked for iZotope RX integration. What would you like to see? Then I was presented with the compulsory Devoncroft survey, which included questions about industry trends, projects, budgets, and emerging technologies, with the key findings from this research to be presented at Avid Connect 2018. Although compulsory there seemed to be a carrot being offered, although I am not sure how useful they will be for independent creative professionals like myself. I strongly recommend that all Avid users take this survey, as it enables us to have a say in what Avid are planning. Although it is a structured survey, there are options for personalised suggestions in a lot of places and it is my view that if we don't comment and complete the survey, it becomes harder to criticise Avid when they don't add the features we are looking for. What Do You Think About The Questions? Do share in the comments below about what you think about the subject areas Avid are looking at in this survey. Are they asking the right questions? Are they looking at features you want? If not what features do you want?